Type out the words above the enemies to defeat them! You can erase the entire line at once by pressing the "DEL" key. Don't wait for the animation to end to type the next word. One attack can target multiple enemies if you're fast enough. If you'd like a targeted practice, you can select which keys you want to disable in the custom game menu. Your score multiplier and time for calculating words per minute freeze when there aren't any enemies on screen between waves. The WPM stat is 100% accurate. See this blog post if you'd like to know more. Default dictionaries of ~56000 words and ~23000 words for english and french respectively. More languages could be added relatively easily since a good part of the work to enable localization has already been done. If you'd like to see another language and/or keyboard pattern please leave a comment! What works? What doesn't? What do you want to see in the game? Hello everyone! I enjoyed playing this game and I hope more updates or more features will come out! Usually I'm quite bored playing these types of games, but this ones hit the right spot! I started on easy mode, but I sweated a lot. Keep it up dev, this is awesome. Enjoy the gameplay! Thank you! There should be a new version up fairly soon featuring updated art. This is such a cool game, I love it! Do you have a ko-fi I can donate to? I really appreciate the sentiment, this is the first time someone offers me money for something I've made (not forgetting the help of others of course). I went through the process of creating a paypal and a ko-fi page but I changed my mind because unfortunately most of your donation would probably have been lost in fees and taxes. Instead if you want to support me, please follow the twitter, get the game on launch and spread the word around! Thank you! Really good game, but the red text is too hard to read. Some characters like Os and Cs look almost the same against the background and make it hard to see what the word is. Additionally, the skeletons bodies will sometimes obscure the white text above the living ones, but this isn't very common and is fixed once they start moving. Thank you for the feedback, I'm aware of these issues and I'm working on fixing them. Thanks for playing! Expect to see a new boss and more polishing of the existing art and gameplay. 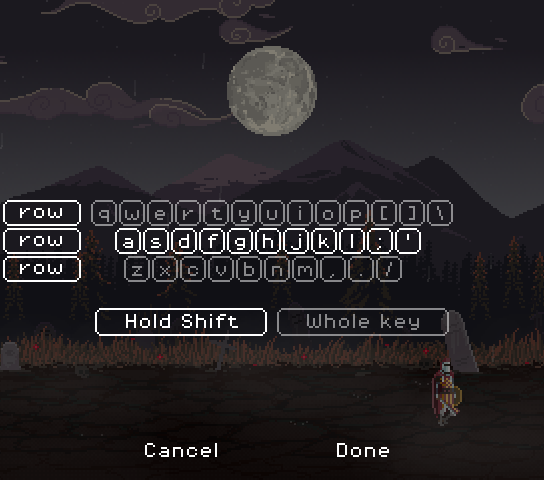 I've been having a great time playing this game even thought, sometime is was kinda hard to see the text, but love the idea and it really helps you type faster! I lost myself in this game. Probably put about 2-3 hours into it and want to play more. This is my longest run on Palindrome Paladin. What a great game. LOVE IT! There's only 6 unique story panels by the way. It loops back after the last one. The game is a work in progress! There's a cooldown bar for the multiplier just under it. If the bar empties your multiplier goes back to 1. You probably got the crazy score by doing a really long combo! Awesome. Thanks for the response! I'll be keeping this installed and playing on and off. It's so much fun and has that perfect "ONE MORE RUN" aspect to it! In the hard mode, the words will overlap on top of other words or on skeletons, making them almost impossible to read. There only have to be four or five on screen before this happens. Words will overlap on top of fallen skeletons' bodies and it makes the words very hard to read. I don't love the timing with the parrying, since it means sacrificing time that could be used attacking. I understand that being able to parry *and* attack at the same time would make it too easy, but maybe close the gap a little bit? What I would do is have the load time to the attack be at the speed that you have it at, but once the user has typed in the entire word and has successfully parried, the enemy's attack can load faster, maybe at 1.5 speed of what it was before the word was completed, so that the gap between parry and next attack is shorter. 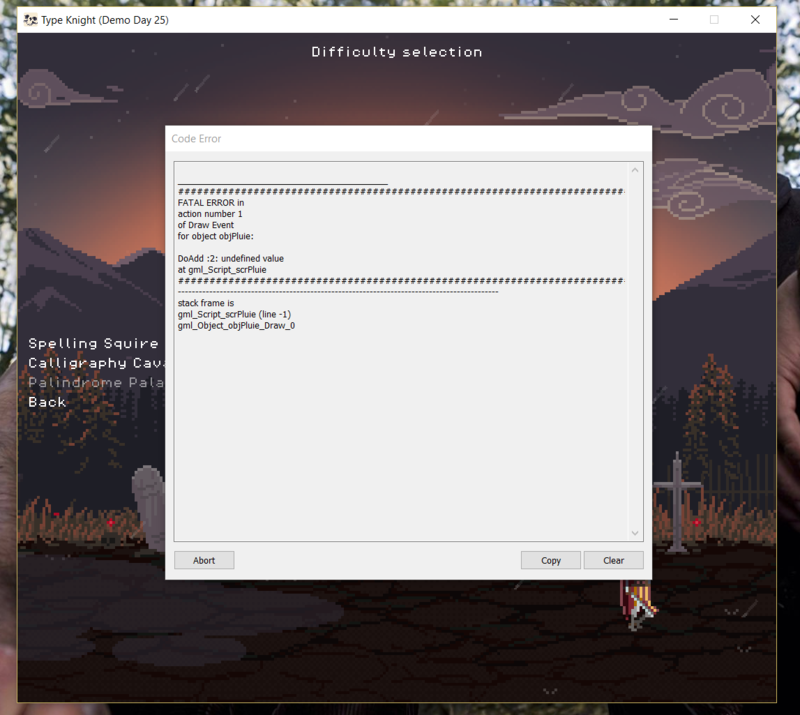 I got a fatal error when trying to load the hard mode one time, screenshot attached. Bats' words in hard mode are very difficult to read. Not sure if it's because of their movement speed or if the text is too shaky. I completed a survey too. Thanks for making a great game, I'm looking forward to future updates! Thank you for playing! I appreciate the feedback. I never see any type game can make likes this which widen my horizontal. Very like your art style reminds me of many classical games when childhood. Very like your game and download it try to play these days. Awesome game but can there be some accessibility options? I couldn't read the red text on the background. Many people have been reporting the same issue. I'm going to do something about it before release. My final score was 209,538! Cool game, wish the red text was easier to read though. Nice! I plan of fixing the red text to make it easier to read. There's a dedicated key (DEL by default) which you can rebind in the options menu and CTRL + backspace also works. I am trying to download and play the game but I am very new to this concept and would like to practice typing in this fun way. Could anyone help with how to get this? Thank you. I suggest you play in the easiest difficulty (Spelling Squire). If you want something even easier, you can go in the custom game menu and disable the top and bottom row of the keyboard like in this picture. I am sorry if my question was not discernable, I don't know how to download the game. Thank you for the advice once I can run it though. Fun! The red text is often hard to see, though. Also, the white text can be hard to see over some surfaces like the puddles. Thank you for the video! It's really appreciated! OOF. How am I supposed to live the boss encounters without getting hit? I'm basically ead after the second one. You're pretty good if you managed to make it this far without knowing how to parry! You have to type the word in red above the knight when it appears. I'm going to find a way to make this clearer in the future. FYI: The merlin lines are in french even though I'm playing the english version. Merlin lines were a placeholder from the last demo several months ago. 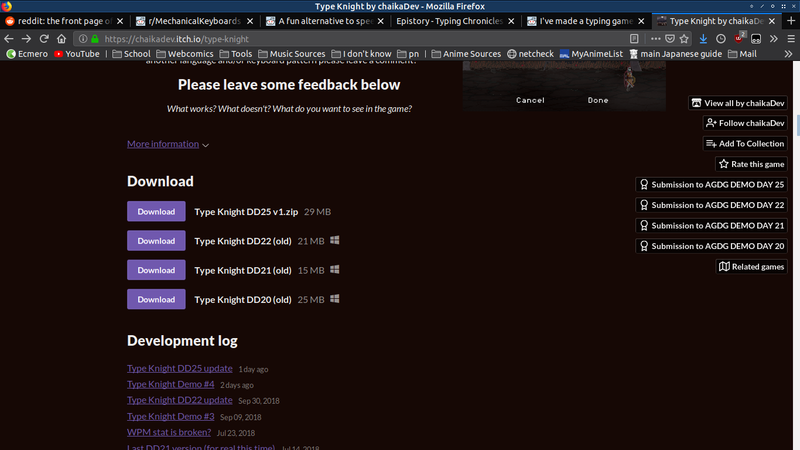 Are you playing the DD25 version? *sigh* I realised, I wasn't. I was playing the version that was accessible by just clicking on "Install" on the itch.io launcher. There wasn't even parry or anything in that version. The gameplay vid I made is out of date bc of that, too :P gonna make another one today. Sorry about that, it's my fault. I realized I forgot to check the windows tickbox after uploading a new build a few days ago. It prevents the game from being downloaded in the itch launcher when you don't. Just wanted to ask: is QWERTZ as a keyboard layout supported? Not yet but it shouldn't prevent you to play. The different layouts are just for navigating through the menus and the on-screen keyboard for disabling keys in the custom game menu. Fun Fact: it's somehow supported. It works without problems. Hey mate I really love the game and it helps me a lot with typing and stuff but I wanted to ask if you could maybe add Hebrew? it'd be really nice if you do. Thank you! I'd like to translate the game into as many languages as possible, including Hebrew. Is it possible to release for Mac? Very possible. I'll look into it before launch along with a linux version. Any news on a linux/mac version? I plan on doing a linux and mac version just before releasing the game. There's still a lot of work to be done before it's ready. I gave it a play and did a write-up on it! Hey, thanks for the feedback! It's really heart-warming to see someone took the time to write an article. Thanks! Which language would you like to see? If you could add JP or KR? I'd love to! I'm not too familiar with Korean, I've heard it has an alphabet-like system? I could do romaji Japanese (or the Korean equivalent) relatively easily. Supporting kanji would be a lot of work. Maybe eventually. Yes, Korean has a picture-ess like alphabetical system. Played this on my channel! I'll have you know that is very difficult to play this and talk at the same time. I really enjoyed your video! About the boss: you just have to take it down as fast as possible at the moment but I could add a mechanic to block damage. Sorry for the rude words, the word selection is completely random. This dictionary only has 56k entries. I used to have one with 400k words and it had an even weirder selection! Is it possible to add a HP item into the game too? Or bonus stages? Yes, I absolutely want to add an HP item! Bonus stages are a pretty good idea, maybe I'll add them to my "to do" list. Hey its a fun game! I have some feedback though, i think some varieties in skeletons would be great. For example some skeletons that heal you if you kill them, slow the time or a skeleton that damages nearby skeletons when killed. That would open up more strategic options. Or even boss-skeletons whose words you need to type multiple times. It does help! Thanks for playing! 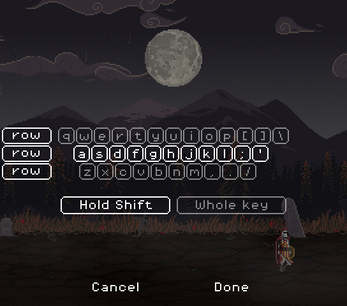 Type Knight is both entertaining and a good challenge to exercise typing skills. Of course, if you're like me and aren't a fast typist, then it's just hard. Still, it's well made overall and has a lot of potential for what it is. 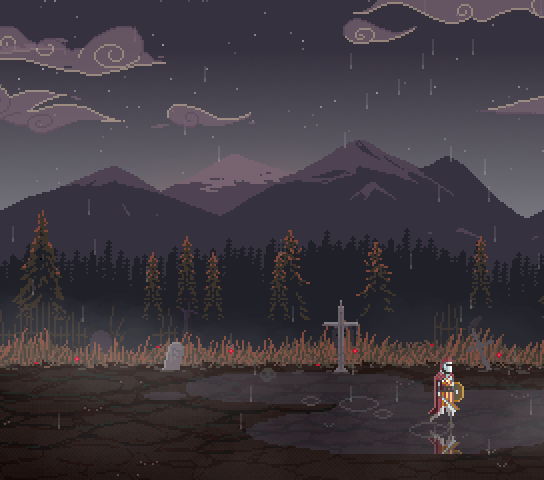 The art style is pretty nice as well. Wow, thank you for the kind words! Watching your video was pure fun for me! I'll definitely make some changes about the difficulty. The game is a work in progress. Ideally I will have a system that adapts to the player's skill. You weren't the only one finding the game hard! Being a typing game, I just assumed it was supposed to be difficult, heh. Still, good job on this. It's a good foundation for whatever you do with it next, so good luck on the updates. If you're taking suggestions, I would recommend enlarging the text that shows when you type and maybe slowing the enemies just slightly. Not a lot, but enough so you aren't getting swarmed after one mistake. Maybe add a mode so they go faster the more you mess up. I'm taking note of these suggestions! I was already planning to add scaling to the options menu. Hey thanks for the feedback, it's really appreciated. A lot of people have complained about the difficulty so I'll definitely change that.